There are 69 Memory Care Facilities in the Saint Paul area, with 11 in Saint Paul and 58 nearby. The average cost of memory care in Saint Paul is $4,630 per month. This is lower than the national median of $4,650. Cheaper nearby regions include West Saint Paul with an average starting cost of $4,495. To help you with your search, browse the 47 reviews below for memory care facilities in Saint Paul. On average, consumers rate memory care in Saint Paul 4.3 out of 5 stars. Better rated regions include Minneapolis with an average rating of 4.3 out of 5 stars. Caring.com has helped thousands of families find high-quality senior care. To speak with one of our Family Advisors about memory care options and costs in Saint Paul, call (855) 863-8283. Minnesota’s statewide initiative in building dementia-friendly communities through ACT on Alzheimer’s benefits over 92,000 affected citizens, and Saint Paul, the state capital, actively participates in this endeavor. The Saintly City has a dedicated Alzheimer’s Research Center and an array of memory care facilities. In Saint Paul as in the rest of the North Star State, housing with services (HWS) establishments that provide assisted living and memory care services for seniors with Alzheimer’s disease and other forms of dementia are called special care units (SCUs). These facilities are registered with the Minnesota Department of Health, which regulates senior care in the state. Saint Paul experiences frigid winters with an average low of 7 degrees Fahrenheit in January, and the occurrence of snow may last from October to April. This may limit seniors from spending time outdoors. Saint Paul’s overall cost of living is 5 percent higher than the national average, primarily due to housing and other expense categories, such as groceries and healthcare, being slightly higher than U.S. averages. Moreover, the average cost of memory care in Saint Paul is lower than in Minneapolis, its twin city. While pensions and retirement account withdrawals are fully taxable in the state of Minnesota, there are several forms of tax relief for seniors 65+ including subtractions and credits on social security income. In addition, all prescription and non-prescription drugs and some grocery items are exempted from sales tax. Saint Paul is home to world-class medical facilities including those specializing in brain health and dementia care such as the HealthPartners Neuroscience Center, Bethesda Hospital Alzheimer's & Memory Loss Clinic and the United Hospital Geriatric Psychiatry Unit in the event of medical emergencies or illness. Memory Care costs in Saint Paul start around $4,630 per month on average, while the nationwide average cost of memory care is $4,800 per month. It’s important to note that memory care rates in Saint Paul and the surrounding suburbs can vary widely based on factors such as location, the level of care needed, apartment size and the types of amenities offered at each community. 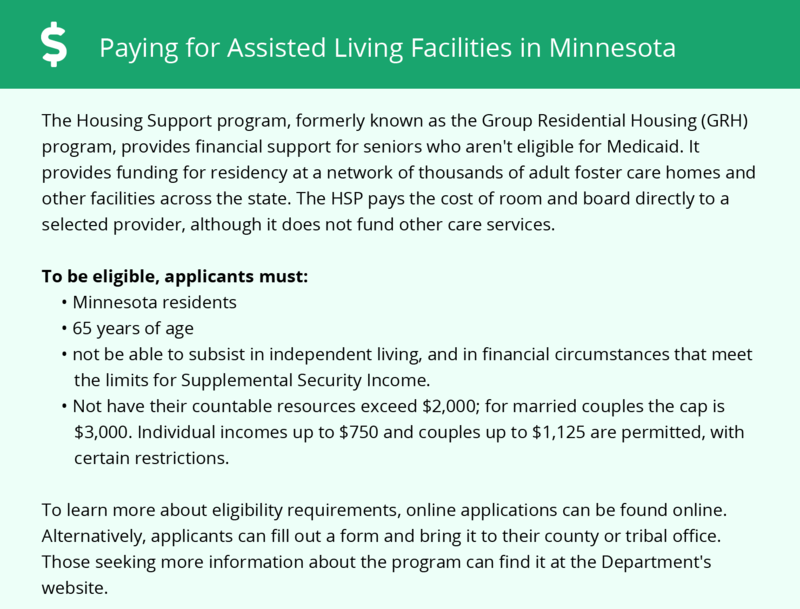 Saint Paul and the surrounding area are home to numerous government agencies and non-profit organizations offering help for seniors searching for or currently residing in an assisted living community. These organizations can also provide assistance in a number of other eldercare services such as geriatric care management, elder law advice, estate planning, finding home care and health and wellness programs. To see a list of free memory care resources in Saint Paul, please visit our Assisted Living in Minnesota page. 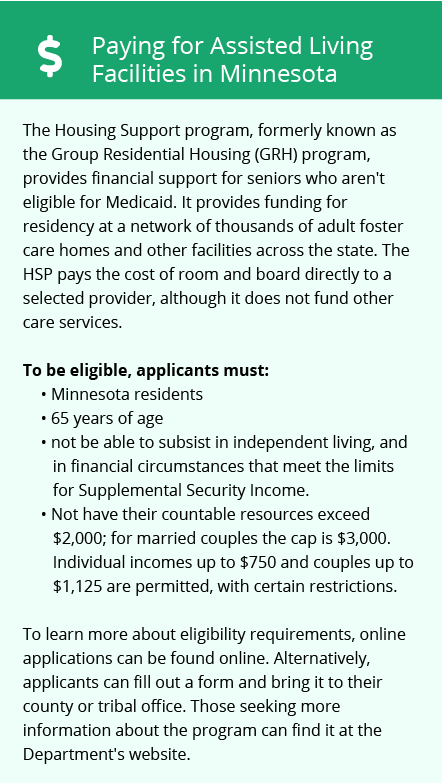 Saint Paul-area assisted living communities must adhere to the comprehensive set of state laws and regulations that all assisted living communities in Minnesota are required to follow. Visit our Memory Care in Minnesota page for more information about these laws.